Cambridge Gage is a classic English green gage, with a high quality gage-like flavour. It is a close substitute for the traditional Old Green Gage, but slightly more vigorous and easier to grow. 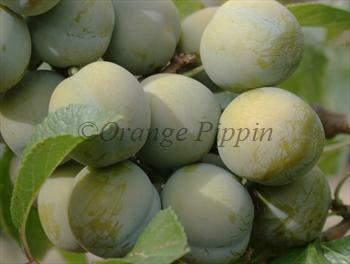 Cambridge Gage ripens towards the end of August, and is equally good as a fresh dessert plum or for culinary purposes. Please fill in the details below and we will let you know when Cambridge Gage plum trees are back in stock. A traditional yellow gage - a good complement to a green gage. The definitive green gage - Cambridge Gage is closely related. An American green gage, a good choice for northern areas. Traditional French green gage, very similar to Cambridge Gage. Cambridge Gage is in flowering group 3. Cambridge Gage is partially self-fertile, but fruiting will be improved if there is a compatible tree of a different variety nearby. Since it flowers in the middle of the blossom season it can be pollinated by most other plum trees. Cambridge Gage is very similar to Old Green Gage in most respects but is generally found to be a more reliable cropper with consistent crops from year to year. As with most green gages it prefers a dry climate and does best when planted in a sunny aspect. Cambridge Gage is partially self-fertile (unlike Old Green Gage) but it helps if there is another pollinator nearby - the popular Victoria plum tree is a good choice. Cambridge Gage is thought to be a seedling of Old Green Gage, and was grown commercially in the Cambridge area by the jam manufacturers Chivers in the early 20th century. It was probably discovered at the end of the 19th century.